Explore Cincinnati's convention centers, hotel updates, destination services, meeting planner guide, online RFP and more. Discover a Midwest city with more things to do, dining, entertainment, world-class arts, museums and affordable family attractions! Discover the New Cincinnati - the latest news, developments and fun facts about this great American city! The Cincinnati USA Convention and Visitors Bureau's Member Directory is your guide to local resources. Whether you're looking for where to stay, something fun to do, a great place to eat, a particular service, where to shop, or how to get around, our Member Directory is the first place to look. Search for a business by name or keyword at right, or navigate our directory by category below. Executive Car and Airport Limousine is a Ground Transportation Company specializing in Airport Sedan, SUV and Van service. We provide Door-to-Door, City-to-City and Hourly Sedan Limousine and SUV transportation out of Cincinnati to any city in the Midwest. Executive Car can provide Sedan, SUV or Van service for dinner, theater, weddings, sporting events or any special occasion where ground transportation is needed. Executive Car has provided Regional Service since 1989 and we're looking forward to the opportunity to become your Ground Transportation Partner. Arrive With Confidence. Travel with our safe, reliable, and professional drivers. 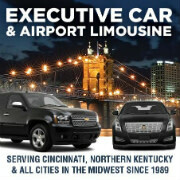 Since our inception in 1961, Executive Transportation Service has been the premier ground transportation company in the Greater Cincinnati/Northern Kentucky area. We know providing safe, clean, new, and reliable vehicles, along with expertly trained drivers is important to you. Because of this, all of our drivers must pass an extensive background and criminal check, medical exam, drug test, and training safety programs. Services provided: Luxury Private Car and SUV, Airport Shuttle Service, Charter Bus, Van Service, and Group Logistic Coordination. We are available 24 hours a day, 7 days a week. Ultimate Air Shuttle offers shuttle service between Cincinnati, OH, and New York City(via Morristown, NJ); Chicago, IL(Midway); Charlotte(Douglas International), NC; Cleveland, OH, and Atlanta, GA on a 30-seat jet. No baggage fees, no change fees, no cancellation fees, and complimentary parking, snacks, wine, beer and non-alcoholic drinks. Ultimate JetCharters, LLC, provides corporate shuttle services to Fortune 500 companies, Sports Teams, Group Travel, and Casino Trips throughout the United States. For all your flight needs, contact Ultimate Air Shuttles at 1-800-437-3931. Located off I-75 & I-275 at Sharon Road. 128 comfortable guestrooms in our newly renovated 4-story tower. We don't believe in pomp and circumstance here - just warm, inviting hospitality. We call it good old hometown hospitality. So come on in and relax. French Master Chef Jean-Robert deCavel welcomes you to his urban restaurant serving contemporary food and drink, rooted in tradition, right in the heart of downtown Cincinnati. Modern French Bistro. Appetizers, wine list and main courses center on meat, served bunless .Beef, wagyu beef, bison, lamb and fish, with compound butters, classic sauces. Separate lounge, view the Ohio River from our patio. Mt. Adams Bar and Grill is a fun, contemporary neighborhood bar and restaurant located in the heart of historic Mt. Adams. Year around customers can sit out on the porch, or cozy up in the warming atmosphere, while enjoying friends, family, and friendly prices. You can find our doors open seven days a week for lunch and dinner! We hope to see you there! Visit the Booksellers on Fountain Square and experience Cincinnati's finest downtown independent bookstore. With books for every age, gift items, greeting cards and more, we have something for everyone! Macy's is a popular shopping destination for travelers coming from all over the world - that's why Macy's Visitor Services offers special programs just for our out-of-town guests. Find an exciting collection of 100 outlet stores from top designers and name brands at Cincinnati Premium Outlets® including Coach, Michael Kors, Polo Ralph Lauren, Saks Fifth Avenue Off 5th, and Under Armour. Conveniently located halfway between Cincinnati and Dayton, off I-75, Exit 29 in Monroe, the mall offers a beautiful outdoor, single-level shopping experience. We invite you to enjoy our exceptional brands with extraordinarily savings of 25-65% for shopping that's always worth the trip. Located at Historic Union Terminal, the very site where many Holocaust survivors arrived in Cincinnati to rebuild their lives, HHC aims to ensure the lessons of the past inspire action. Through innovative storytelling, interactive experiences, and genuine artifacts, visitors will witness the strength and courage of the human spirit set against the backdrop of one of the darkest chapters in Human History. They will then move on to the Humanity Gallery where they will see examples of individuals who have worked toward making positive changes in our community and be challenged to think about what we can do as individuals to become upstanders and take action on topics that affect all of us. Belterra Park Gaming is a fully-integrated entertainment center in a beautiful setting along the Ohio River on Kellogg Avenue in Cincinnati, just off I-275. Featuring the latest and most exciting gaming; six restaurants including Favorites, Stadium Sports Bar and The Market Buffet and Live Thoroughbred racing. At Belterra Park, you'll never run out of things to do! Vent Haven Museum is the only museum in the world dedicated to ventriloquism. Housing more than 900 dummies used by ventriloquists from the 19th, 20th, and 21st centuries, Vent Haven's uniqueness draws tourist from literally around the world. Vent Haven Museum offers tours. During the tour, tourists learn about the history of ventriloquism, hear the stories of the famous ventriloquists, and can try their hand at doing ventriloquism with a puppet. Tours are by appointment only from May through September. Bus tours are welcome year round. Fifth Third Arena is in the final phase of a privately funded, 20-month, $87 million renovation. 5/3 Arena is the home to the University of Cincinnati Bearcat basketball and volleyball teams and is available to for external event rentals and functions. Fifth Third Arena will officially be re-opened on November 1st, 2018, as the Bearcats take on Ohio State in their first home opener.